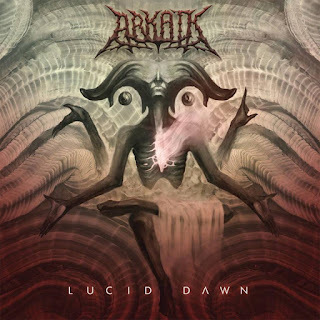 The Inland Empire's metallers has returned with a stimulant dose of Progressive Tech Death metal, Arkaik, came out more than ten year ago and since then, they have always treated us with creativity and brutality spreaded in their songwriting "Lucid Dawn" is the fourth full length in their discography and who else could released this album, well no other than Unique Leader a label reputed by acts like Deeds of Flesh, Fallujah, Inanimate Existence and Gorod just to mention few ones, the band current lineup is Jared Christianson on vocals, Ivan Munguia in bass, Alex Hernandez-Bent on drums, Greg Paulson on guitars and Miguel Esparza as lead guitar. Tech Death metal is a very difficult subgenre to be successful, because it demands a lot of creativity, intensity and precision all blended in a cohesive form to explode in the right way at the right moment, loaded with a shredding riff, accurate blast beats and tempos that lead you into a labyrinth with chaotic sounds but disciplined. 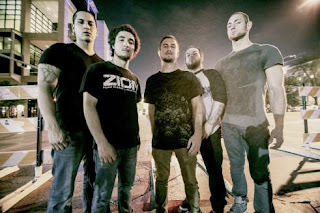 "Lucid Dawn" captures the essence of the sub genre and packs it in a tremendous production, the albums kick off with a classic guitar "Intro" and rapidly takes you to the next track "From the Void" with ambitious riff and devastating bass lines supported by exceptional drums by Alex Hernandez which collide with sickest vocals of Jared Christianson, "Digital Shroud" made of a groovy riff and blunt vocals works out to shine the jazzy bass solo by Ivan Munguia, "Awaken the I" is an astonishing track that delves in groovy riff interwoven with melodies and a vicious guitar solo by Miguel Esparza, "Fleshwalkers" defies the beautiful chaos with that intro and suddenly it is immerse in nauseated riff and relentless drums, the onslaught is inevitable for the listeners, the self titled album "Lucid Dawn" is indisputably the kind of Tech Death metal that holds up this album, vibrant, intricate musical structure with sharp riff, powerful vocals that lay on a meticulous drum, the closing track doesn't let this album down at all "Temple Aflame" with a crushing riff, raspy vocals that rip your ears apart, actually the track is listed to last almost sixteen minutes, but end up around the minute 4:50 playing some outer sounds as wood burning in a pit and then a sample that talks about space, time and cosmic creation. I believe that Arkaik has delivered a solid album within the subgenre, clever songwriting, clean production as demanded by the style, the potential contained in this album, can put them clearly into the eye of the storm, but definitely it requires them to explore and stretch the boundaries for their next recording, meanwhile if you liked Suffocation, Obscura or Decapitated, well you should try Arkaik, you might end up enjoying them.